You can arrive and leave any day and stay as long as you like (min. 2 nights). When you get to camp, you’ll be greeted with a welcome beer or sangria, shown to your tent home and orientated (beach is that way, beers are that way). Then we shall commence bliss time. We do daily yoga, there’s snorkeling, cliff jumping, tanning, swimming, oh, and drinking. We’ll feed you a hearty breakfast and make you a take-to-the-beach lunch and we’ll make the most of the daylight hours. Come sundown, we’ll start sipping more heavily on our unlimited booze while we make ready for the party night ahead. We’ll head into town to party at one of the hot Ibiza clubs, or we’ll dance on the beach under the stars. Located at beautiful Cala Martina, where the beach is stunning and the vibe is a bit more chilled. Our camping is just 50 meters from the beach, so an easy stroll to the sea to relieve that stonking headache of yours, or alternatively fall out of bed and into our open bar for a hair of the dog or our free daily yoga sessions. Situated close to great public transport links to get you all around the island, or if you want to stay a little closer to home there are lots of bars/restaurants nearby. Meet us there. Accommodation: There are multiple accommodation packages on offer. Please read the room descriptions. Basic accommodation is tent only. You will need to bring your own mat and sleeping bag. Meals are not included. Includes pre-erected tent accommodation, sleeping bag, mattress, breakfast and packed lunch, plus various activities throughout the day and discounts on club entry (ask your Stoke guides for more info). No curfew, but we have to stay quiet around the camp from 11:00pm, so we head to the beach. This is an adult campsite largely due to the free flowing alcohol so no under 18's allowed. Check out by 11:00am but you're welcome to leave your bags and hang out for the day. Without a doubt the best decision to stay here! Staff was great, the place has a unique vibe rollin every time, ocean is 50 meters away, beer pong all day, pay 10€ per day and I had limiteles beer and sangria, breakfast was delicious, dinner is really good and for a good price. Also one thing I really liked is that it was a completely different experience that staying in Ibiza town or San Antonio, this part of the island is really beautiful, cheaper and has a lot of nature! I really recommend! What an amazing time at the Ibiza beach camp. The entire Stoke staff is awesome as are most of the people that attend the camp. The delicious included meals plus unlimited alcohol for 10 extra Euros a day are a can’t beat especially in Ibiza. Awesome experience through and through. Will definitely being staying with Stoke on future trips. Friendly and welcoming environment. All facilities provided along with food and drinks! Excellent place if you’re looking for a unique place to stay while on vacation. It is also close to a beach if you’re looking for something relaxing to do after a long night out. One of the best trips I’ve taken in my life! I met so many amazing people at this camp and the whole experience was life changing! Shoutout to Hamish for always ensuring that we’re all having a good time. We’ll be back next year for sure!! Friendly staff... atmosphere very vibrant at the camp... tent very small and only basic facilities .. if someone wants to experience staying in tent then may think of going .. The camp was fantastic to stay at, especially for a lone traveler. It is what you pay for. The unlimited booze is a must and you get the chance to meet a lot of people from around the world. Cliff jumping and yoga was a blast and always good meals. The only con would be the far trip into town to go out, but, that can be combatted by going with a group. All in all a great experience. Would recommend. 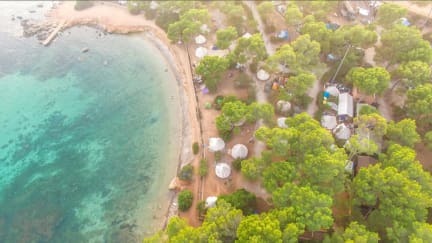 despite the fact the i stayed only for two days in ibiza, booking in ibiza beach camp was a great step for me, the atmosphere was perfect and i met great people plus breakfast and lunch were offered for free , i'm surely planning to visit again by next august, Cheers ! Second year at the camp. Enjoyed my stay as always the people make it. Really liked the improvements with fans and less sand in the communal areas. Food was good and tent was clean but too hot to sleep during day due to heatwave. Some of the staff this year didn’t seem as friendly this year. The location and the activities offered by the camp are fine. The pictures and description of the property do not reflect the actual conditions. Do not stay here. The sentiment was shared by others in the camp. Again, do not stay here.